The Marysville Historical Society is located next to Jennings Memorial Park in Marysville, Washington. Located at 6805 Armar Rd, Marysville, WA 98270. 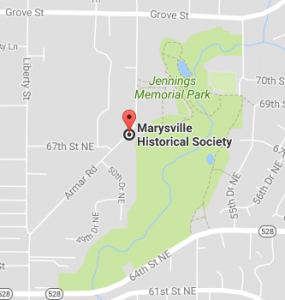 The Marysville Historical Society hold the General Meeting the second Monday of every month, see our Membership Page for a schedule of meeting times. The Gehl Home is a look back at the living conditions of Marysville pioneers. The home is open for tours Memorial Day Weekend to Labor Day Weekend, Noon to 4 p.m. We also conduct special tours upon reservation, contact our office at (360) 659-3090. The Norwesco Telephone Museum joined the Marysville Historical Society and their exhibits will be part of the new Museum.